As I sit here at my kitchen table this morning writing these words, the world outside my kitchen window is bright. The sky is washed in a delicate blue and the newly risen sun is spilling it’s weak light at the bottom of the garden. Last Saturday, for the first time in months the garden called me back outside. I spent some time cutting back some unruly bushes and clearing dead leaves from the flower beds. As I worked clumps of snowdrops were nodding their tiny, delicate heads in the breeze. Beside them, shoots of were just appearing to break through the earth, infant daffodils and tulips. Birds were busy on the bird feeders. Mother Nature has begun to stir. The energy of life which is naturally drawn inward during the long, dark winter is beginning to surface again; a quickening that heralds new life. Today, February 1st is traditionally the first day of Spring here in Ireland. The natural world confirms this. It is time for planting and growing. Today is also La Le Bride or the feast of Brigid. St Brigid is the female patron saint of Ireland. But Brigid was also a very important pagan Goddess. She is associated with the hearth (heart of the home), poetry, weaving and smithing. She is an inspiring and timeless symbol of caring and nurturing. Yesterday there was a wonderful (short) article about her in the Irish Times which articulates perfectly why Brigid is relevant today more than ever. 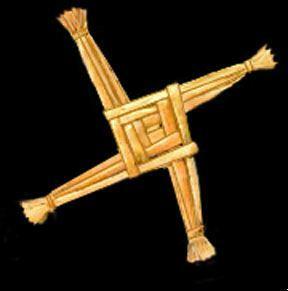 Today is traditionally the day for making a Brigid’s Cross. These crosses, made from rushes were hung over the threshold of the home for protection. Farmers also often hung then in cow sheds for the same reason. We live in the parish of St Brigid in Cabinteely and my children go to the local school, St Brigids National School. Every year the girls in 4th class are taught to make these ancient crosses and so our home is never without one over the front door. So today, celebrate the return of springtime, make plans for some planting in your garden or your window box soon. And may Brigid (Goddess or Saint) bless your home and all who live there. bless every fireside, every wall and floor. and every tongue and mind forever more. and every foot that walks its portals through. The photo at the top of the page is of a beautiful stained glass window by renowned artist Harry Clarke which is in our local church. It depicts St Brigid holding an acorn and a lamp, symbols of faith and strength. Lovely post, B, I love the blessing. I like the Goddess association with the name, I may call myself Goddess Brigid from now on. It is truly a lovely day to start Spring. Happy St. Brigid's Day to you and yours. What a beautiful post and a timely reminder that we can always start over again..! Hope surely springs eternal at this time of year...Happy St Brigid's Day, Barbara. Happy Spring, Barbara! Thank you for a lovely, inspiring and informative post. A lovely post for St Brigid's Day! We couldn't believe that neither Murray nor Sorcha's school mentioned about St Brigid today. Thankfully I have my cross from last year! Great to feel that touch of spring this morning! Hmmm...I already commented but perhaps it didn't go through. I was just coming back to tell you that because of this lovely reminder I went out in a blizzard and picked reedy weeds - soaked them for two hours but alas alack they wouldn't soften. I did make a good Irish dish for dinner that I got from a site that also had how to make the Brigid crosses. Did you ever know about the practice of keeping a candle lit for Saint Brigid? Hey there Goddess Brigid... I hope you feel very special on the 1st of Feb.. good to hear form you! Thanks for the good St Brigid Day wishes all..
Jan - today is Candlemas when candles are blessed and put in windows! So go ahead and light that candle now!